On 4 May 2017, Sydney North Health Network formally announced six new mental health and suicide prevention services at Community Care Northern Beaches (CCNB). Federal Member for Mackeller, Mr Jason Falinski MP, launched these new services commissioned by SNPHN. “The Sydney North Health Network has consulted extensively with the mental health sector, GPs, clinicians, our mental health advisory committee, the Local Health District, providers and the wider community to design the Mental Health and suicide prevention services that will have the most impact and support those in greatest need across the region. This new range of services now available respond to matching the right level of intervention to the intensity of need – ranging from low intensity mental health services through to severe and complex mental health service clinical management,” said Sydney North Health Network Chair Dr Magdalen Campbell. 12 in 100 people in the Northern Sydney region report mental and behavioural problems with depression and anxiety being the most commonly diagnosed mental health disorders. In 2013, 71 deaths occurred in the Northern Sydney region due to suicide, averaging one death every five days. Certain population groups in the Northern Sydney region are at higher risk of suicide and self-harm, including humanitarian entrants, men aged 75+ years, lesbian, gay, bisexual, transgender and intersex community members and young people. In Northern Sydney there is a higher rate of hospitalisations for mental disorders (2,686 per 100,000) among Aboriginal people compared to non-Aboriginal people (1,860 per 100,000). CCNB will provide care coordination and psychosocial support to people who have been hospitalised following a suicide attempt. These outreach services will assist clients to maintain safety, build resilience, access required services and further develop support networks. Lifeline will provide telephone based coaching services for people living in the Northern Sydney region who are experiencing mild or moderate mental health difficulties such as low mood, anxiety and stress. They will support people to access self-help tools and resources, and develop greater resilience and enhanced wellbeing. New Vision Psychology will provide one-to-one and group based psychological interventions to Cantonese and Mandarin speaking people across the region. Services will be flexibly delivered and include outreach services where required. Relationships Australia, in partnership with the Gaimaragal Group, will deliver culturally appropriate mental health services to Aboriginal and Torres Strait Islander people across the region. One-to-one service coordination will support Aboriginal and Torres Strait Islander community members to access necessary mental health and related support services. Relationships Australia and the Gaimaragal Group will also provide capacity building activities in the local region, focused on supporting culturally safe practice. PCCS will provide one-to-one psychological interventions and care coordination to identified underserviced and at-risk groups across the region including people who identify as LGBTI, people from culturally and linguistically diverse backgrounds, children and young people and women experiencing perinatal anxiety and depression. PCCS will engage the previous ATAPS workforce to deliver services across the entire Northern Sydney PHN region. Services will be flexibly delivered based on client needs. Lifeline Harbour to Hawkesbury will provide group based therapeutic interventions to identified underserviced groups across the region. These group programs will complement one-to-one services and support people to build their confidence, manage the symptoms of anxiety, stress and depression and learn new skills in a safe and supportive environment. “Our Central Clinical Intake and Triage team will work with referrers such as General Practitioners, Hospitals, self-referral and service to service to ensure that the Northern Sydney community are correctly matched to the mental health and suicide prevention services they need. Some people may need telephone or online support due to general stress and anxiety, group support or one on one psychological services through to rapid response and care coordination following a suicide attempt of suicidal thoughts. 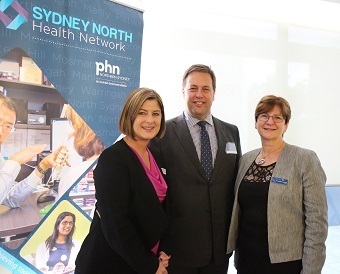 All commissioned services will provide a holistic and responsive experience from referral through to delivery of services,” said Sydney North Health Network CEO Lynelle Hales.